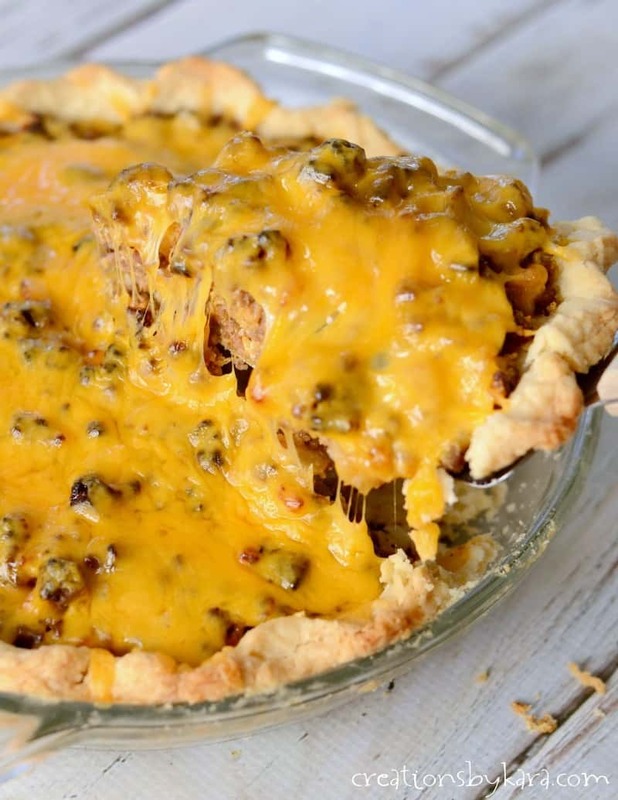 Bacon Cheeseburger Pie . . . all the flavors of a cheeseburger, but eaten in slice form. An easy family friendly dinner recipe! I am always on the lookout for new dinner recipes that don’t require a lot of prep time. 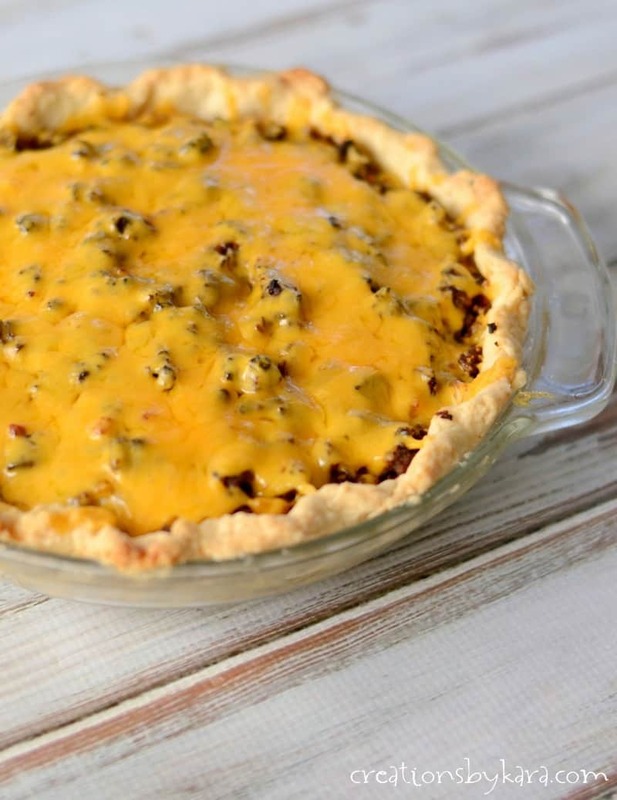 This cheeseburger pie is a new favorite. I’ve made it twice in the last month, and everyone in my family loves it! Truth be told, no one in my family likes cheeseburgers because they don’t like American cheese. So of course for this pie I topped it with cheddar, and they gobbled it right up. I made my pie crust from scratch, but if you use a pre-made pie crust, this dinner is really quick to throw together. I even used the Hormel bacon bits, so I don’t have to cook the bacon. You can use bacon slices if you prefer. The first time I made this, I used ketchup and mustard in the filling. The second time around, I used barbeque sauce instead of mustard, and we thought it was much more tasty. The smoky flavor of the barbeque sauce compliments the bacon just perfectly! If you love bacon, cheese, and hamburger, you have got to give this recipe a try. 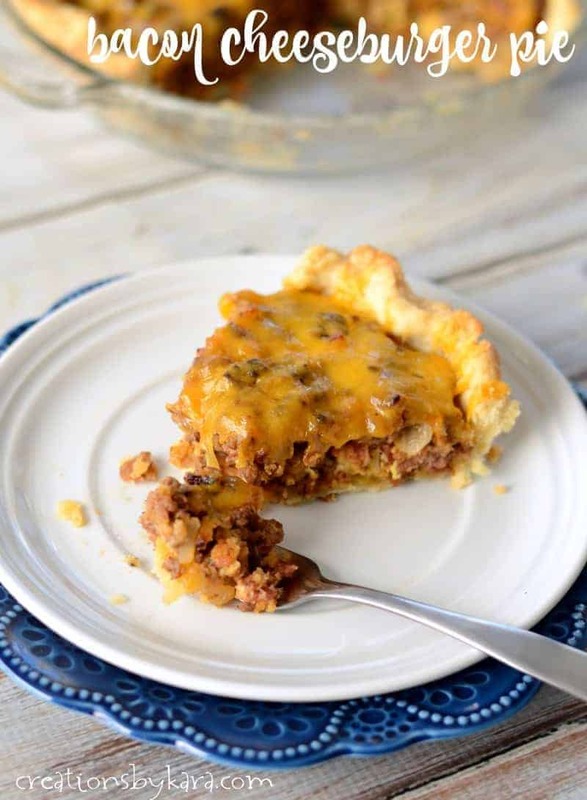 Hearty meat pie with beef and bacon, topped of with shredded cheddar cheese. Cook ground beef and onion in a large skillet till meat is brown. Drain any fat. Stir in garlic, bacon, bread crumbs, ketchup, BBQ sauce, Worcestershire sauce, and pepper. Heat through and spread in the bottom of the pie crust. Whisk together the egg and milk; pour over the meat mixture. Bake at 400° for 20-25 minutes or till crust is light brown. Sprinkle cheese over the top and bake 3-5 minutes more or till cheese melts. Serve hot. 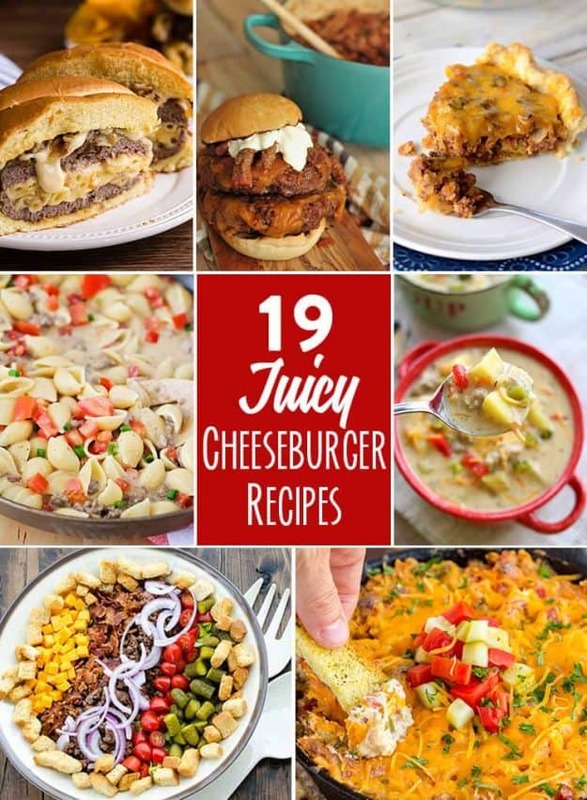 Today happens to be National Cheeseburger Day, so I am teaming up with my fellow bloggers to bring you over a dozen cheeseburger recipes. Prepare to drool! I just wanted to tell you that I LOVE THIS RECIPE! It is on repeat in our home. All of us love it, it is super simple and quick to prepare, and tastes delicious! Thank you! I look forward to trying your other recipes. Thank you! This is so good! I made this a few times and everyone loved it. One time we were out of bbq sauce so I subbed A1 and it was fantastic, too. A1 sounds like a great substitution. Thanks for the tip! We tried it and loved it! Do you think it would freeze okay? I’m thinking of making two and freezing one. I’ve never tried freezing it, but I think it should work just fine. Give it a try and let the rest of us know how it turns out! This is one delicious looking pie. 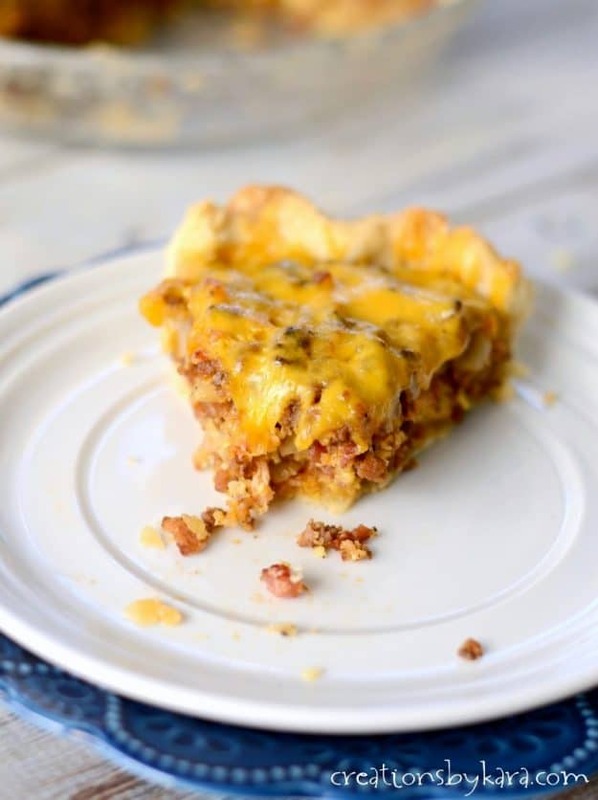 I almost got a heart-attack when I saw the words “bacon cheeseburger pie” written together – this is awesome! Thanks so much Isadora! It really is yummy! Love the idea of this savory pie! Thanks so much Laura. I haven’t tried many savory pies, but we liked this one so much I need to branch out and try a few more for sure!